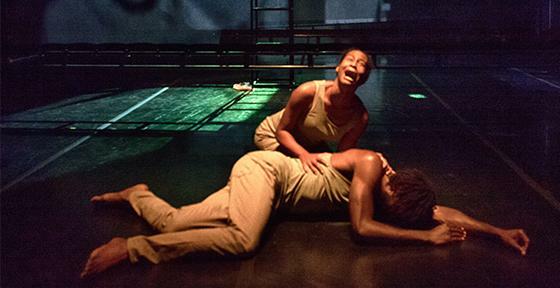 The African American Performing Arts Coalition and the Black Choreographers Festival: Here & Now are presenting Zaccho Dance Theatre's Between Me and the Other World in free performances as part of ODC's Walking Distance Festival. This potent work is a dynamic exploration of W.E.B DuBois' concept of "double consciousness." Saturday June 3 & 10. Opportunities abound for youth at Zaccho! The Zaccho Youth Company invites enthusiastic young people ages 9-18 to come be a part of this exciting ensemble. Potential performance opportunities in the fall include being a part of Zaccho Dance Theatre's The View from Here and African-American Shakespeare Company's production of A Midsummer Night's Dream. Looking for young acrobats for a circus/dance project this fall. The View From Here is a dance/circus piece inspired by the life and art of Marc Chagall, directed by Joanna Haigood and Jeff Raz. We are looking for 10 student and pre-professional acrobats who also have strong movement/dance skills. Must be able to work in a professional environment. Two weeks of performances in October; rehearsals in September and October, mostly evening during the week. To apply, send cover letter, resume and picture to Jeff Raz -- jeffraz@aol.com. Zaccho Studio is honored to have hosted the development of Artist in Residence Ross Travis' new show Bucko: Whaleman! Using the provocative humor of bouffon (a form of grotesque satirical physical theatre in which characters on the outskirts of society use subversive humor and ecstatic play to highlight ignored or marginalized issues). Bucko investigates religion, natural resource consumption, racism and privilege in maritime history and juxtaposes these subjects with our modern times. Meet Captain Bucko and his scurvy crew, on the crest of the most bountiful whale hunt of their careers. But where does man's ambition end? How do you lay down your harpoon and bring home the haul when the thrill of the hunt consumes you? Come join the slaughter ye salty dogs! Take advantage of another opportunity to find your flow in the Aerial Yoga hammocks. Join Marie Walburg for another 6-week Embrace - Aerial Yoga Series from May 16-June 20. You don't need to be a dancer or an advanced yogi to come to this series but you need to have practiced a few times in the Tuesday evening class at Zaccho. Summer Camp is Filling Up! Don't miss your opportunity this August for 5 fun-filled days of fun, discovery, creativity and challenge at Zaccho's Youth Summer Camp! In a non-competitive environment of dance/theatre games, acrobatics, aerial dance and yoga, students will hang upside down, cartwheel, dance and fly!